Moscow prosecutors have searched the homes of several Russian opposition figures. They are investigating the violence during previous protests. The searches came a day before a key opposition rally in the Russian capital. Officials of the Russian Investigative Committee have searched the homes of Aleksey Navalny, Sergey Udaltsov, Ilya Yashin and TV Journalist and socialite Ksenia Sobchak and some other Russian opposition figures. 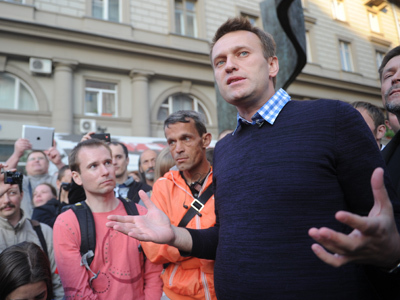 Investigators have also conducted a search at Navalny’s relatives’ apartment. It has been reported that riot police surrounded Aleksey Navalny’s office this morning, but they were not allowed in as the search may only be conducted in the presence of Navalny. “At 8 o’clock in the morning people burst into my room. They did not allow me to put my clothes on, robbed my apartment, humiliated me,” Sobchak twitted on her blog after the search. “I never thought we would be back in the country of SUCH repression,” she added. Meanwhile, the search of Navalny’s apartment has lasted for more than 12 hours. The searches were done as part of a larger investigation into the clashes between radical opposition activists and riot police, which happened on May 6. “All in all the investigation has more than ten searches at different sites planned. 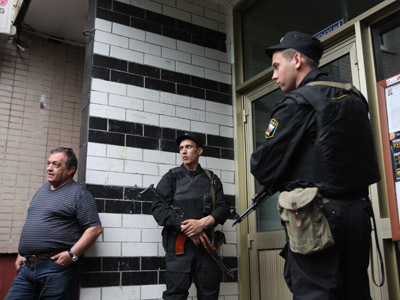 Individuals, whose homes have been searched, have been summoned to the Investigative committee’s office for legal procedures on June 12,” spokesman for the Investigative Committee Vladimir Markin said in a statement. The officers seized computers, flash memory and digital devices as well as documents and political banners, and up to 1.5 million euros from the apartments. Lawyers for some of the opposition activists said the searches and summons were illegal and that they would challenge the investigators over it. “It’s an act of intimidation. Nobody notified anyone. I believe the searches are absolutely unlawful,” said Vadim Prokhorov, who gives legal advice to Yashin and another opposition leader, Boris Nemtsov. People close to those under investigation allege some lawyers were not allowed to be present during the searches. Investigative Committee’s Vladimir Markin denied the allegations, saying everything was done in strict compliance with the Russian prosecution code. 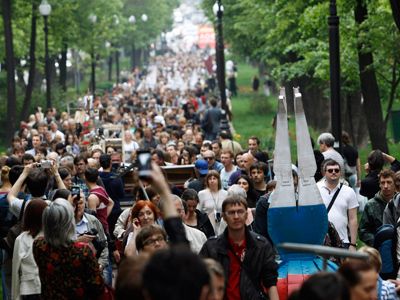 Several of the people searched were among the organizers of the May 6 march. The opposition march in Moscow turned violent after stones and flares were thrown at police officers. Some opposition leaders accused the police of triggering the violence by unreasonably narrowing the passage for the march. In recent days prosecutors have detained 12 people suspected of being involved in the clashes. A court has ordered six of them to remain in custody and put another one under house arrest. The searches came just a day ahead of a sanctioned opposition rally in Moscow. Navalny and others, who are now bound to appear before the prosecutors on Tuesday, are part of the organizing committee for the event. Opposition leader Udaltsov and human right activist Sergey Ponomarev, already branded the searches an attempt foil the event. 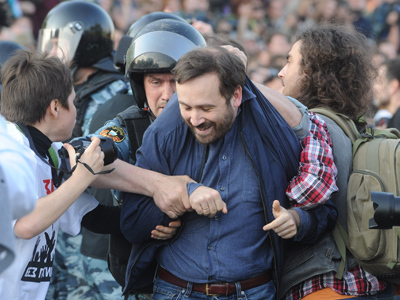 “They are trying to make the more radical members of the action angry, to provoke the people and turn the action out of control,” Ponomarev said. Nevertheless organizers of the rally said it will happen anyway. “It’s all according to plan. The only change will be an increased number of participants. But that will happen in response to the actions of the authorities,” opposition activist Sergey Davidis told Interfax news agency. Tuesday’s protest rally in Pushkinskaya Square and the march to Sakharov Avenue were expected to attract up to 50,000 participants, according to the organizers. Davidis said they will ask the police to provide more metal detectors because of the increased turnout he expects. Monday’s searches and the way they were performed undermine the credibility of the Russian law enforcement system, the chair of the presidential human rights council Mikhail Fedotov said. “I would like to understand why these searches have been conducted on the eve of a mass event authorized with local authorities,” he said. Police are carrying out searches and summoning the opposition to interrogations in order to prevent riots at tomorrow's meeting, believes political analyst Sergey Markov. "The sense is that the government will now have a European approach to these rallies: anyone who raises a hand to the police should be in prison, those who organize mass demonstrations with the intention that they will not just be rallies but riots will take full responsibility in accordance with the law," Markov was quoted as saying by Kommersant FM radio.